Chapter 6G in Traditional Quaker Christianity is on eldering and oversight. Those correspond to roles that come from the New Testament, and they’re called various things in different Christian traditions. Eldering and oversight are also interpreted very differently in different Christian traditions. Sometimes eldering is described as “nurturing ministers.” We’ve talked about the position “minister” before. We’ve also talked about traveling ministers having an elder to accompany them. Eldering can mean encouraging ministers in their ministry. As in, just saying “thank you” when a message speaks to your condition is eldering. Unfortunately, “eldering” is sometimes used as a synonym for “scolding,” and that just doesn’t cover all of it. Elders also deal with the rest of the meeting, too, though. The book suggests a distinction between eldering and ministry as being specific versus general. A minister gives general advice to the whole meeting. An elder gives specific advice or queries to an individual. Drawing a clean line between those is probably actually pretty hard. Mackenzie notes that the Ohio Yearly Meeting definition of an elder maps really well to her meeting’s definition of the ministry and worship committee. To Micah’s, surprise, Ohio Yearly Meeting does have term lengths for elders. Oversight, in Ohio Yearly Meeting’s definition, means dealing with all the physical stuff of running a meeting. That includes taking care of the building and hospitality They deal with the physical needs of the members. They’re drawing a sharp line between spiritual and material matters. Mackenzie points out how this mostly corresponds with the pastoral care committee in her meeting. There’s a difference, though. That sharp line is missing. Someone may suffer spiritually because of unmet physical needs. A holistic approach is more appropriate then. Outside of Ohio Yearly Meeting, you’ll find people divided up into far more than just these three categories. Larger meetings elsewhere might have a entire committee just for dealing with the physical spaces. They might have an entire hospitality committee for doing after-meeting lunches. Another committee might deal with social order—charity, service, and advocacy. In fact, the bulk of the meeting membership would be engaged in what Ohio Friends call oversight. There’s a neat little matrix at the end of this section, showing how these Friends think about the categories of ministry, eldering, and oversight. Given their designation of ministers as giving broad and extensive vocal ministry while elders are brief, we wonder how they think of Liberal Friends. If you’ve listened for a while, you may recall that we described Liberal Friends’ vocal ministry as lasting two to three minutes, with Shatner-esque pauses. Mackenzie: Welcome to Quaker Faith & Podcast, where we will explore traditional Quaker beliefs and the variety of Quaker beliefs found today. 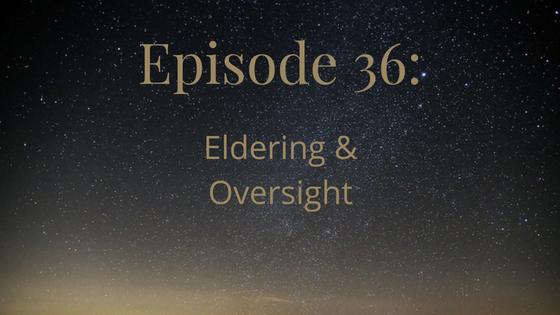 Hi, it’s Quaker Faith & Podcast with Mackenzie and Micah, and today, we’re talking about eldering and oversight, or elders and overseers. I think first, we’re going to talk about what these things mean, and then we’ll talk about a little bit of controversy. Micah: Yeah, and I think when we discuss what these things mean, the reality is that within the Quaker tradition, they mean all sorts of things, and then if you were to take it beyond that, [inaudible 00:00:42] like Christians, because of course, “elder” and “overseer,” these are referring to … They’re referring to roles mentioned in the New Testament. Mackenzie: This chapter has the longest list of readings I have seen in the entire book, just so we’re clear. Micah: It doesn’t surprise me, because Ohio Yearly Meeting takes their understanding of eldering very, very, very seriously, and so I think just … We’ll put a caveat here that we are probably in this episode going to be mostly reflecting on Ohio Yearly Meeting’s interpretation of eldership and oversight, but just be aware that this is a particular Ohio Yearly Meeting view that we’re probably going to be focusing on, and that it kind of means something different everywhere. Mackenzie: Yeah. Okay, so it says in here that “Eldering involves encouraging another person or a whole group to faithfulness, that is, putting faith into practice. It helps with discernment, motivation, caution, and feedback, and provides recognition and development of others’ gifts and supports a spiritual climate in which ministry and personal spiritual growth can flourish.” The way I’m used to hearing it summarized is that elders nurture ministers. Micah: Yeah. What does that mean? Mackenzie: We’ve talked before about there being people who are called to ministry, and how … We talked about how with traveling ministers, they’d often go in pairs, and it was not exactly mentorship, but … Well, I don’t have a lot of experience with Ohio Yearly Meeting, so what I personally noticed previously is that if you look in Ohio Yearly Meeting’s Book of Discipline, their description of an elder is almost exactly the same as Baltimore Yearly Meeting’s description of the Ministry and Worship Committee. Mackenzie: And then similarly, Ohio Yearly Meeting’s description of the overseers is almost exactly the same as Baltimore’s description of the Pastoral Care Committee. So as far as I can tell, us BYM folks renamed it at some point. Mackenzie: Yes, although I’m not sure how different that is in practice, because I know that there are terms, like term lengths for the elders and overseers in Ohio Yearly Meeting as well. It says so in the Book of Discipline. Micah: I never heard that. I mean, I guess I sort of figured maybe with the overseers, but I didn’t realize that with elders. Mackenzie: Which does not mean that they’re old. Micah: Right, although in practice, it does, in Ohio Yearly Meeting. Mackenzie: Well, that’s because everybody in Ohio Yearly Meeting is old. Mackenzie: I know like two people without gray hair in that Yearly Meeting. Micah: Sad story, told many times before. Mackenzie: Spiritual maturity, though, as opposed to chronological maturity, would be the thing that you’re talking about with elders. Micah: Yeah. So minister, if you’ve heard of deacons, deacon comes from diakonos, from the Greek, which means servant, and so diakonos means minister, so if someone used the word “deacon,” it actually means minister or servant, right? Then there’s presbyter, which is elder, and that’s translated as priest in the liturgical traditions. And then there’s the bishop, and I’m forgetting what the actual Greek term is, but it’s very similar. And there’s bishop, which is translated by many groups, including Quakers, as overseer. Right? Micah: But it’s funny, right, because overseer, they’re the bishops. Like, the bishops in Quakerism are at the bottom of the totem pole everywhere, whereas in the liturgical traditions, the overseers, the bishops, are at the top. So it’s kind of funny. Mackenzie: Which … Are they underseers, then? Micah: Underseers? Well, no, and the funny thing is that a lot of people listening may totally disagree with me on this, be like, “Oh no, overseers are totally equal, blah blah blah.” And maybe they are, right? But officially, officially, overseers are equal, are sort of equal leaders, but it’s been my experience that the glory tends to go to ministers or elders, and overseers are not seen as being as spiritual. Micah: Like saying you’re eldering somebody. Mackenzie: Right, and so there’s a bit in here that’s talking about eldering, but the extent to which we use it as “scold” can be not even about spiritual things, which that seems weird. An example … So, in the book, something they give for an example is … They say, “Some people are uneasy with the idea that Friends can help each other distinguish between acts that are spiritually right and those that are wrong.” And it says that “Eldering is often specific and personal. Ministry given in meeting for worship might offer a general caution about being tempted to greed or pride. Eldering would more typically involve saying to someone privately,” so not calling people out, public shaming, et cetera, but going as a friend to somebody, hopefully as a friend to somebody, lovingly, et cetera, and say something like, “I think your new job sounds wonderful, but with that bank salary, are you going to be able to maintain your simple lifestyle?” Which is an interesting one for them to give as an example, but whatever. Mackenzie: … these could be two different concerns depending on what the new job is, right? Micah: Especially if you have kids. Micah: Yeah, it’s good to get affirmation on vocal ministry, because it’s not always … You don’t always feel certain to what extent you were faithful, and it’s good to know that it resonated with other people whose discernment you respect. Mackenzie: Right, and that … Or even separate from … And because we all should encourage each other anyway, right, whether something is your particular specific gift, or just a thing that you incidentally have from time to time. Because with strengths and weaknesses, even if something’s your weakness, you can still do it some. Micah: So, what do you think about having these three … You know, there are three, but I guess we’re talking about two of them, the elders [crosstalk 00:11:43]. Mackenzie: Well, we talked about ministers a few times before. Micah: Sure, sure, sure. But with elders and overseers, what’s the purpose of naming these roles? And have we really talked about what overseers do? Mackenzie: No, we haven’t gotten there yet. Micah: Maybe we should talk about that. Mackenzie: But, well … So, although, related to what you just said, here’s a little quote. “We may want to turn our understanding that anyone can be used in vocal ministry or eldering into an assertion that everyone will be equally used. However, we do not have much trouble recognizing [inaudible 00:12:12] and appreciating individual gifts in music, sports, healing, et cetera. We easily say, ‘She’s a gifted musician’ or ‘He’s a true athlete,’ so the meeting and its individual members should also be alert to signs of consistently operating spiritual gifts.” And I think that is something where … That’s definitely a tendency to try to sort of ignore that somebody has a particular gift, because then, well, that would be unequal. But no, we have strengths and weaknesses, and they balance each other out. Mackenzie: And actually, you know what, Biblical for a second here, in 1 Corinthians when it talks about being the body, and the … You have ears and nose and eyes, and the ear isn’t useless because it doesn’t see; it hears, that’s its job, that’s its thing that it does, and everything … You know, if somebody … If your pancreas decides that it’s just … It’s going to go it alone and not be part of you, well then, you’re going to need to get insulin some other way. Micah: Why don’t y’all just call them pastors? No, I mean … No, [inaudible 00:13:53]. That was a silly question. But in Friends of Jesus, we, as you mentioned, I think, in an earlier episode, or was that this one? Mackenzie: I don’t know. Look, we’ve recorded … This is the fifth thing we’ve recorded today, so we’ve kind of lost track. I think that was this one. Micah: Okay, okay, well anyway, as you’ve mentioned before, in Friends of Jesus, we’re focusing on the APEST roles: apostle, prophet, evangelist, shepherd, pastor, teacher. And I think the word “shepherd” is pretty good, because it sort of gives that sense of like you’re caring for a group of people. Mackenzie: Right, and nowadays, because “pastor” has the implication of the, usually, man who stands up front and talks, saying “shepherd” clarifies that we don’t mean that. Micah: This sounds a lot like what many churches call deacons. Mackenzie: Okay, which is funny, because this is [inaudible 00:15:09] with bishop, yeah. But they … Now, interesting to me is that they also add, “The duties of hospitality and building committees can also be seen as oversight,” which that’s definitely something that’s separated out in the meetings I’ve been part of. And, I mean, the meetings I’ve been part of have all been very large meetings with 10 or more committees, which is too many committees, guys. Micah: So basically, overseers slash shepherds slash deacons, but whatever, this group, it seems like every church recognizes this type of activity. It’s just all the practical stuff. It’s like the ministers do the talking, the elders do the advising and the making sure things don’t go off the rails spiritually, and the shepherds slash overseers slash whatever do everything else, basically. Like, everything practical is sort of their job. Mackenzie: Well, actually, so I’m actually finding interesting the … So, something that is a little different between how they divide it up and how it is at my meeting is that for us, pastoral care includes both the spiritual and physical needs of members. Mackenzie: Like, Pastoral Care Committee is who does marriage clearness, or clearness committees for other decisions, whereas Ministry and Worship Committee focuses more on what is happening during the hour together on Sunday, and focuses on things like our Spiritual Formation Program, and I think … I’m not sure if we … Like I said, too many committees. I’m not sure if it’s Ministry and Worship or Adult Religious Ed that handles the Quaker 101 newcomer class, but whatever. Micah: That makes sense. I think that Ohio Yearly Meeting in particular has, as we’ve mentioned, Ohio Yearly Meeting has a tendency to divide things pretty strictly into spiritual and not spiritual, and I think we heard in the terminology they’re using here for overseers that overseers handle the non-spiritual stuff. Micah: Right. So, I mean, maybe that’s a mistake, but I think that is the way that Ohio Yearly Meeting tends to conceive of things. Mackenzie: Mm-hmm (affirmative). Well, and I guess … I think maybe that, yeah, I think the way that we have in BYM, having pastoral care include both spiritual and physical stuff makes more sense, because they impact each other. Mackenzie: Right. You know, Micah and I have talked before about a friend of ours who, as a result of unmet physical needs, was then having spiritual problems, and addressing those together was very important. Micah: Yeah. Yeah, I think that if you’re talking about shepherding, shepherding does involve both physical and the spiritual and psychological pastoral care. Micah: Well, the … I mean, just like, frankly, just like the early Quaker writings and preaching, the Bible is not systematic theology. Mackenzie: Well, right, yeah. I mean, yes, the Bible is a whole bunch of separate … The Bible is not one book, it’s a library. Micah: But even within the library, it’s not systematic theology. Micah: … we don’t … And yeah, ultimately this is sort of a radical Protestant ethic, actually, is we want to get back to the messy, vibrant, complex reality of the Scriptures, rather than just sort of contenting ourselves with one systematic theology that a few people came up with a long time ago, if that makes sense. Micah: Rather than trying to systematize it all, we’re like, “Well, what do the Scriptures actually say?” And there are tensions here, and we need to live in these tensions rather than resolving them through adherence to a single systematic theology. Micah: Yup, yup. I think, to sort of bring it back to the overseers, I think … Well, maybe not overseers, but to shepherding, because I think overseers maybe, for Ohio Yearly Meeting, means very specifically physical needs, but for shepherds, I think a role of shepherds and teachers is helping us get to the point in our spiritual maturity where we can handle the tension. So, I’m a very new software developer, I’ve been working in software development for a little over a year now, and I work … My supervisor’s a much more experienced software developer, and for him, when he looks at a question, he sees tension, and he says, “Well, there’s one way I could do this, and here are the advantages and disadvantages. There’s another, and it has advantages and disadvantages too.” And there are like three different ways we could do this, they’re all very reasonable; it just depends on what we’re going for. Mackenzie: What are the trade-offs that we could accept? Micah: Right. But for me, I really need him to tell me just what he thinks is the best. Micah: Exactly, because I’m not mature enough as a developer right now to make those calls; he is. So I think there’s some application of this to faith, where Quakerism can be sort of a … Can be a confusing and unhelpful place when you’re coming in as a spiritual beginner, because there’s a reticence to give you clear answers. And so I actually think that’s a real strength of some traditions that are able to offer clear and succinct answers to complex questions, because spiritual children, spiritual babes and infants, need milk, not meat, right? That’s sort of how Paul puts it. Spiritually immature people, spiritually young people, need food that they can handle, right? And when they’re older and more mature, they can handle more difficult food. Micah: And so, in the same way, I think it’s a strength to be able to offer simple answers to complex questions. The question is, can you answer the complex questions in simple ways and straightforward ways when that’s the answer that people are ready for, but then also create a culture and an environment where we are ready to hold tension when we’ve learned the basics? Mackenzie: And frankly, I think that’s a serious problem with a lot, or possibly all … I mean, close to all churches, and handling spiritual maturation, like, the answers … We’ve talked before about me having been an atheist at one point, right? And not having the whole “old guy on a cloud with a beard” thing, and that’s … God as old man on cloud is your very simple description that you give to small children that, once you start growing and maturing, maybe that still works for you, but maybe it doesn’t. And if you don’t start providing other options early enough, that can be a serious problem for people staying in faith. If you’ve only been given your one very simple answer, and not … And shielded from all complexity, and then you find that there’s complexity there, and you’ve been told, “What complexity? There’s no complexity, conform to the simple thing,” then you’re going to see that these don’t match, and walk away, and I think that’s why it’s so common for teenagers to leave the church, and also seminarians. Micah: Yeah, so I think for … And we’re veering a little bit off from specifically Ohio Yearly Meeting view, but I don’t really care, because I think their meeting’s a little bit … I love Ohio Yearly Meeting, you know I do, you’ve heard me say all such wonderful things about them, but I think their view here is a little bit warped. But, so to talk about not just oversight as Ohio Yearly Meeting conceives of it, as a physical thing, but of shepherding as a holistic care for the individual which includes spiritual nurture, I think that a really … An important role of the shepherds is to help create … The shepherds and the teachers, is to help create an environment where there are succinct, simple, and clear answers available, but there’s also room and a culture of holding tension, and of accepting ambiguity, and exploring things, and developing discernment. Mackenzie: I think something that’s just … As far as Ohio’s view goes, something that’s nice is that in this book, on page 155, there is a chart where they explain … Where they’ve got a column for ministry, a column for eldering, and a column for oversight, and they’re like … It’s comparison for typical differences between ministry, eldering, and oversight. And all of the boxes except one is filled in, and that’s on a line that says “vocal messages in worship.” Ministry has “broad or extensive,” eldering has “succinct,” and oversight is just blank. Mackenzie: Well, like I said, just because you have a strength doesn’t mean that the weaknesses are completely absent. Mackenzie: It’s what’s your pie chart look like? Micah: Yeah. Shepherds can definitely give vocal ministry. And actually, I really do think, if I had to characterize the vocal ministry, or the vocal ministry of shepherds, I would say it probably takes two modes. One is comfort, and the other is prophetic defense of the community’s integrity. Micah: Also, that … Again, I hate to be picking on Ohio Yearly Meeting, because y’all know I love you, but I think that’s wrong. How can you be prophetic without discernment? Discernment is at the heart of prophecy. You can’t … If you are not discerning, and you’re a prophet, you’re a false prophet, because you’re saying things that are not discerned from God. It’s like, yeah, you can’t have prophetic ministry without discernment, so I don’t get how you make a distinction between the prophetic ministry of the minister and the discernment of the elder. Mackenzie: Just a thought about how that could work. Mackenzie: That we have a pie chart? Micah: Yeah, and just remembering that these are models, not reality. Micah: Turns out I was right. Mackenzie: But then, like I said, that there have been a few times where clearly, the shepherd thing popped up for me to help a couple of our friends, so yeah. Micah: Yeah, these models … And this is just a concern that I had, and have had, as a part of Ohio Yearly Meeting, just like … I feel like the threefold model of minister, elder, and overseer, I mean, five that we’re experimenting with in Friends of Jesus can sometimes feel limiting, but three is really limiting, to … Like, everyone falls into one of three boxes? Wow, that’s really tight. Micah: Some people in Ohio Yearly Meeting might agree with that. Mackenzie: That’s possible. Because the practicality, I think, is a lot of what a lot of us are focused … Like, we’re busy with how can we help people, how can we work things better. A lot, if you looked at our committees … I’m saying that Building and Hospitality Committees are, as far as they’re concerned, oversight. Well, we definitely break those out into separate committees, so, I don’t know, something like maybe half of the committee, half or two-thirds of the committees at my meeting are ones that they would say are all oversight, but … And yeah, I think you are correct that if … You know how we were saying in a previous episode about the “no alcohol at Ohio Yearly Meeting” thing? If it was not completely unethical to spike someone’s drink, I think that — and therefore, you could get them to speak freely, because in wine, truth — that yeah, they might say that we don’t have any ministers over in the liberal branch. Micah: I definitely [inaudible 00:32:46] would need to get drunk to get them to say that. Mackenzie: Oh, now I’m thinking about who … Oh. There’s a specific person that I could definitely see saying insulting things about liberal Friends [crosstalk 00:33:02]. Micah: Now, now, reputation of others. Mackenzie: No, I didn’t say a name. But yeah, I could think of somebody. Mackenzie: And I realized while editing this that during the intro, I totally said there’s going to be something about controversy, and then we completely forgot to mention it while we recorded. Just the controversy thing was that the reason a lot of meetings have gotten away from the term “overseer” is because in the United States under the system of chattel slavery, the person who was the enforcer, basically, on plantations was called the overseer, and so there’s a lot of concern for sensitivity in speech to not use a term that has such a tight coupling to slavery in the US as one of our churchy words. So that also … That’s probably why … I should say that has been cited as a reason why to not use that term, and to instead prefer, like, Pastoral Care Committee.